It’s near the end of March and Spring Break is still going strong. 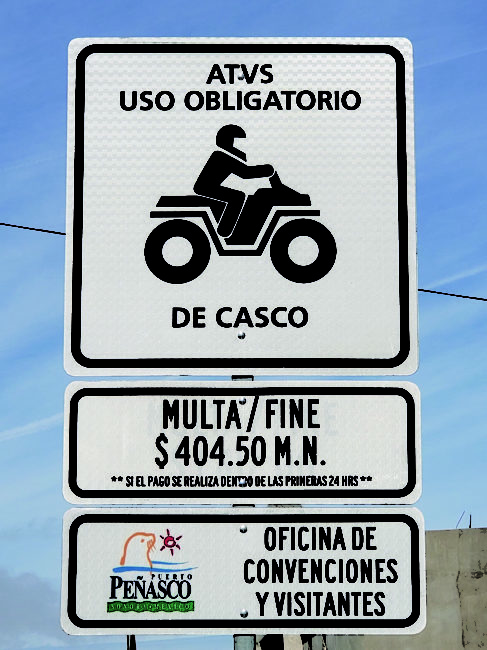 If you were down last month you may have noticed the new signs around town, mostly in the “touristy areas”, which display the fine for NOT wearing a helmet when riding an ATV, which is $404.50 pesos (see photo). A great addition to the city since the more information we can provide people, means the less they are surprised when pulled over. Now if we could only tackle the stop sign placement, visibility and height problem, life would be great! Next month is Semana Santa, which means another great month for our local businesses, and more great weather. If you want to see some professional partying, then you need to come down the week leading up to Easter. Never have I seen Calle 13 packed full at 7:00 AM. (Who am I kidding – I saw the photos on Facebook!) I despise the word Epic, but it is indeed Epic! The office will be closed for a few days during Semana Santa so watch Facebook for the dates and other up-to-the-minute info., events as well as border crossing, and highway info. If you see something you think others should be aware of then be sure to let us know so we can post it for the good of everyone – whether it’s a fun event, long border line or accident on the highway. I did a bit of my own Spring Break goofing off yesterday – paddle boarding out in front of my home at Laguna Shores Resort – and it was an absolutely gorgeous day: 72°, water was a nice temp. and the sunshine was absolutely awesome. No Jumping fish landed on my board and I didn’t fall off and get wet so that made it an EPIC day – okay enough of that! And when the tide had receded, I took my beasts (Great Danes, Breezy and Nero – 190 lbs. and 150 lbs. respectively) out to a “shell island” – an island that’s about a 15 min. walk straight out from our house. It’s only exposed at low tide and always has some great shells. I did paddle out to it yesterday as well, but it’s too hard to look for shells and try to stay on my board! I’m so glad we can enjoy the ocean here in Rocky Point in March!! Something else that has me excited about living out at Laguna Shores Resort is their brand new restaurant, Infusion del Golfo. Executive Chef, Tony Acuña infuses local foods and flavors into his new menu. I am loving the interesting flavors he is pairing together, and his cooking is very “clean” and seasonal and so, so delicious. The restaurant is beautiful inside and out and has some great features like a “Chef’s Table” in the kitchen, where Chef Acuña personally caters to you: Infusion also has a wine display/cave and different dining options (and bar seating) on 2 levels with different atmospheres. And I’m very excited that he knows his wines and will be featuring pairing dinners in the future. The Grand Opening was March 23rd so I’ll be giving you lots more info next month. 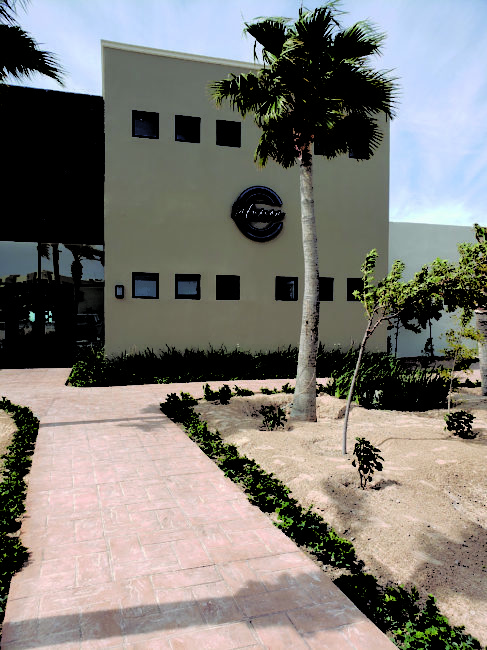 Infusion del Golfo is open to the general public, even though it is located in our private, gated resort. How many have you booked your 11-day cruise aboard the Astoria? I have…yay!! Treasures of the Sea of Cortez will be Rocky Point’s first outgoing cruise. It departs on December 7th of this year and we will visit Topolobampo, Mazatlan, Cabo San Lucas, La Paz, Loreto, Santa Rosalia and Guaymas with a couple days at sea. There are still cabins left for this maiden voyage, though they do have other dates scheduled if you can’t make this first one. You can book your cabin, view the ship and accommodations, itinerary, prices, etc. on their website at www.cruiseandmaritime.com or call Cruise & Maritime Voyages at (U.S. Toll Free) 855-206-4897. Should be super exciting and another “first” we get to experience here in Rocky Point. 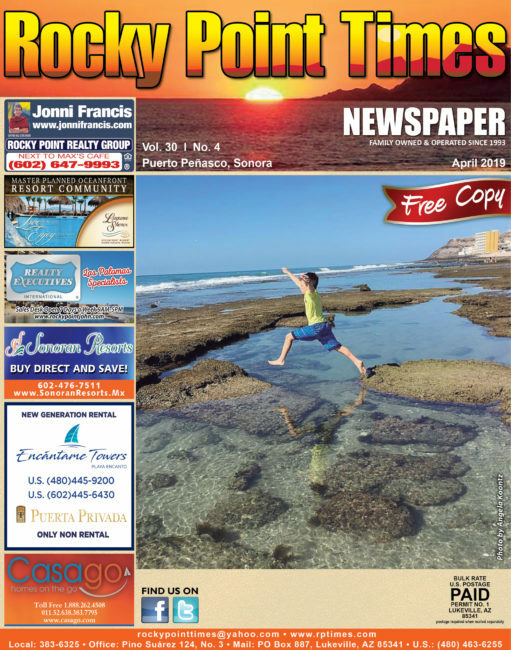 The Rocky Point Times has been publishing for some 25 years now so we’ve seen just about everything…except cruise ships!! In other good news, we’ll be having an El Golfo Memorial Run for my Mom, Sandra O’Hare on Friday, May 17th, Saturday the 18th and Sunday the 19th. It will be our usual 3-day run and I’ve scheduled it over the weekend so more of you can attend. The Survivor’s Party will be after the run on Sunday the 19th at 4:00 PM at the Satisfied Frog in Old Port. Kris and Rick Nichols have been nice enough to accommodate our motley crew. Alicia will post the El Golfo motels and their phone numbers on Facebook so you can make your own reservations or hit her up at rockypointtimes@yahoo.com if you need help or have questions. Come one day, or two or three. If you want to attend the party on Sunday, but are not going on the run, please feel free to come and join us at the Satisfied Frog. If you could let Alicia know, that would be great. Some of you may have noticed that the guard shack at the entrance to Las Conchas has been shut down. The physical building still stands, and I believe there are still guards patrolling the area, but the City has stated that the area is public property, NOT private, so they cannot limit access to the general public. 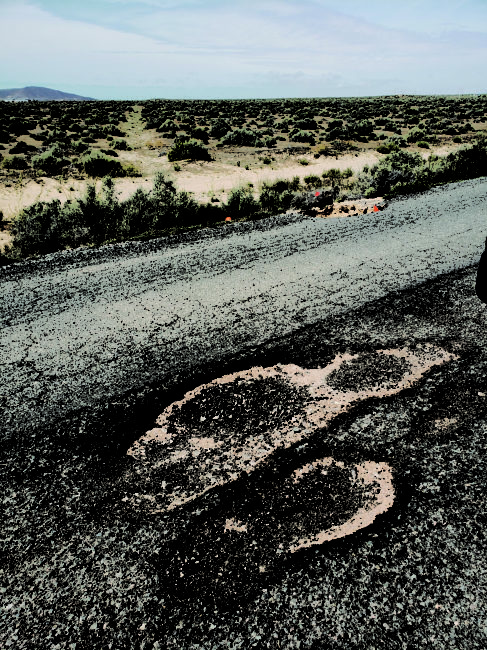 There are HUGE potholes all around town, on Highway 8, and on the Coastal Highway. And they are posing a very serious problem. We have received many complaints about the condition of our roads and though we have passed on your complaints, and our own, they just seem to be getting worse and worse. 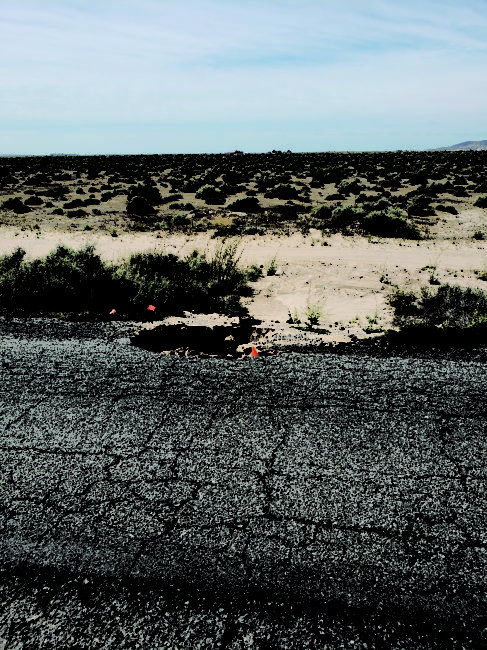 The one pictured is the infamous “crate” pothole that’s located on the back road between the windmills and the Coastal Highway intersection. It was filled (with sand), but we had more rain and now it’s a crater again. And to make things worse, the other side of the road now has 3 potholes at the same exact spot. I have a pretty wide truck so I have problems travelling in either lane if there is another vehicle coming at me. I drive that road all the time so I am aware, but I know many people go that way to Sandy Beach – big trucks hauling big trailers, motorhomes and little cars – who may not be aware of the terrible condition of the road. And it’s not just that spot. People are constantly driving in the opposite lane to avoid these deep potholes all up and down the road. So just be aware and slow down. The potholes are everywhere so slow down and keep your eyes open and keep a safe distance between your car and others. I drove the Coastal Highway 003 on February 15th, on my way to Yuma and then again on March 4th, on my way to Mexicali and the highway was an absolute NIGHTMARE! On my Feb. 15th trip there were a few potholes to dodge, but by March 4th I thought I was on the Caborca Highway, which has also been reported as the “worst it’s ever been”. There were trucks pulled over with damage to their tires, as well as cars, and a Jeep appeared to have lost his tire and completely damaged the back end of his vehicle. So, for now, do not drive either highway at night until these holes are fixed and be careful around town. We will keep reaching out to the City and State to see if something can be done. Have a happy Easter and Semana Santa and we hope to see lots of you on the El Golfo Run and/or at the Satisfied Frog at the end of the Run.